Webheads in Action is planning an online convergence on May 18-20, 2007. To sign up, go over there and click on the left side of the page to create a log in username. It will be a lot of fun, but look at the amazing speakers! Honestly, I could never get enough conferences! They inspire me and more importantly, they connect me. I have so much to learn! Will you be there? The WOW2 show that I co-host with Jennifer Wagner, Cheryl Oakes, and Sharon Peters has moved to a new feed location at http://feeds.feedburner.com/WomenofWeb2?q=womenofweb2.xml. If you're subscribing over itunes or any type of reader, you'll want to delete the old podomatic feed and switch to this one. We really have a great time over there and are so grateful for the amazing folks at edtechtalk who make it all happen behind the scenes. I always make it a point to catch at least one of the other shows over there each week. They work very hard to bring the best in educational programming for teachers. OK, I know that some of you may be just sick of hearing about horizon. It is a great project and it is my life right now! (Along with efolios, senior movies, and 5th grade bloggers). Karl Fisch so kindly delivered the keynote address to our horizon project over the weekend and it is embedded in the wiki. With the Horizon Project, you now have the chance to improve on my vision. In some ways, your task is easier than mine was, because you have the Horizon Report to use as your basis. But in other ways, your task is much harder. While I could make up the future, your vision has to be much more grounded in current reality. And your vision has much more potential to impact people around the world, because what you guys create will be seen by students, teachers and schools around the world. They really want to know what you think the future of education looks like – your ideas really matter. While that might be a little bit daunting in some respects, I hope you also find it exciting. Because just like I was trying to do, you can help all those students, teachers and schools - you can help change the world. It is exciting that so many are helping with the Horizon project. Remember, horizon is not the only game in town! Yes, our dual purpose of horizon by nature is to document best practices in such open projects and thus has involved many great people. We are blessed with their presence. But lets remember that this about connecting students for their better good. It is part of a good education to know that you are part of a world with differing cultures, people, and even languages. It is important to see yourself as part of that world where techno-personal skills matter. It is important for teachers to model connecting. Yes, Horizon is a great project, but there are many others who are also doing great projects. I blog a lot about this project, well, because I'm a part of it. I invite you to share about your project and how you are connecting students globally either here in the comments on your blog. 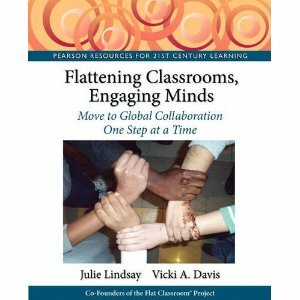 I have so much to learn and hope to never have the "not invented here" syndrome, we all need to work together to formalize and share the best practices of teaching in a collaborative world. And if you believe you have an expertise to share, please join us in the horizon project, send me an e-mail about how you want to help and join in and share! coolcatteacher at gmail.com. We hope to expand to more classrooms in the fall, join in! So many educators, like myself, attend online conferences and webcasts and use our RSS feeds as our primary sources of education. These tools have revolutionized my life and my classroom! I am a better person, mother, teacher, and person because of them. So, with the proliferation of peer to peer (P2P) types of communications why do we still need face to face (F2F)? I can give you a couple of reasons I still make the effort to have F2F with those who are the best. 1 – Surround yourself with the best – become like the best. We carefully watch the friends of our children because we know that our children will become like them. Likewise, I have always taken the philosophy of finding the best most inspirational people and doing whatever I can to be around them and learn from them. Although I am presenting, I have a notebook and am ready to take notes tomorrow on all the things I will learn. I’ve already had great conversations tonight with Gwen Solomon, Judy Saltpeter and some of the other amazing writers and editors at T&L. I already have several ideas of things that I need to do and things I need to share with others! Then, I schedule to go to see the people, EVEN IF THEY ARE PRESENTING ON SOMETHING I (think) I ALREADY KNOW. The reason more educators don’t get inspired is because they think they know it all already and they don't hear from the best. The best will always work to add the most innovative and exciting things to their presentation, even if it is on an "old" subject. Although I consider myself pretty proficient in RSS, this year I sat in on RSS session with Will Richardson (See his RSS guide for educators.) and I learned SO much (like how to RSS a delicious feed). I also learned how to teach delicious to others! This directly impacted the horizon project I'm working on now, and I already knew RSS! So, since I’ve started planning my conferences around people and not as much around topics, I’ve been so much happier. (I still have one or two topics on my hot list, but work hard to hear from those who others say are exciting or that I know.) I come away inspired and amazed every time. And I’m not saying those people need to be super popular, I enjoy hearing everything that my friend Stephen Rahn in Georgia has to say. He is a great educator with the best interests of the classroom at heart and although he is not on “the circuit,” he is on my circuit! When I had the ability to invite a guest to TechForum, I asked my WOW2 friends, who is a very cool educator in Chicago, they all answered, JANET BARNSTABLE! 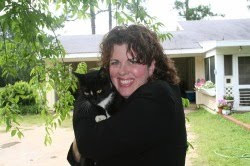 She is a pioneer in Web 2 classroom practices, and was globally collaborating even in the 80's with a dial up connection. I am also so looking forward to meeting David Jakes. 2 – Engage all of your senses and jumpstart your thoughts. When you go to a conference and meet people, you then engage every sense in learning – you’re talking about ideas over dinner. You’re chatting casually. You’re thinking. Often it causes Ah Ha moments and when you can see people, you can also pick up their body languages and nuances that you wouldn’t if you were reading an e-mail. I find that I am focused and more engaged because of my presence at a conference. As a teacher, I spend so much time talking, answering questions, and facilitating their classroom, when I get away I often find I can think more clearly. It is like the artist who steps back to observe his work – sometimes stepping back is a good thing. Even in the busy airport, I found as teacher that it was unusually quiet for me. Quiet, because I didn't have to say a word! I like to sit back and listen and learn. I need to be on the receiving end sometimes. If you’re always pouring water out of the pitcher without refilling the pitcher – you’ll end up with a dry pitcher! My students say that I go to a conference already in overdrive but come back in an even higher gear. I often create podcasts for them about what I've learned. I love to "blow their minds" and push their "horizons" with new things, websites, tools, etc. Because I teach "how to learn new software," they can count on some new things that I'll mention but not necessarily give a "point and click" instruction about. By going to conferences and attending high quality, amazing people’s sessions, I always become filled back up again. Onward to today! I look forward to meeting so many cool people! How exciting! I appreciate her and the other volunteer's willingness to jump in and bring attention to and get feedback on this project. It is very exciting! I'm packing to head to Chicago tomorrow for the TechForum with Technology and Learning! So many amazing people to meet there. I'll be sharing with you. Want a blackberry: Make your cell phone into one! One step closer to the mobile office in your hand. RIM (the maker of Blackberry software) announces that software will be available this year to install on cell phones with Microsoft Windows Mobile Software. It will give your cell phone blackberry type services like checking e-mail. Meanwhile, it seems that political candidates may be more accessible to the masses during the next Presidential Election. Online debates and methods of posting questions for candidates are being planned! The world is changing and meanwhile, every spare moment of mine is being spent on the horizon project (10th grade), efolios (9th grade), the senior movie production (12th), and the graduation movie (11th). Fifth graders are blogging but have been turned back over to their teacher! They now pretty much blog during their classtime! Meanwhile, I've been frantically cleaning my room (it always borders on chaos), Dr. Shepherd is coming to observe my students working on Horizon tomorrow! Meanwhile, let me leave you with this! On Thursday, April 19, 2007, a message threatening violence was reported to have been sent from the home computer of a freshman student at Colquitt County High School. It was investigated and the student was removed from school. The police were notified. During the evening hours rumors began spreading of acts of violence to occur at Colquitt County High School today to commemorate the anniversary of Columbine. The rumors continue to be investigated, but at this point there has been no indication that there is a basis. The Moultrie City Police and the Colquitt County Sheriff’s Department are maintaining an increased presence at the schools and particularly Colquitt County High School. School officials are on alert for any actions that may be out of the ordinary. I ask your help in addressing any rumors as together we work through difficult times to assure student safety and to eliminate rumors. *Note: Mr. McCoy has also sent a phone message to all Colquitt County Schools parents with the contents of this message. There's nothing on the Internet yet but I'll share more when I find it. Who knows if the rumors are true.? Yet another reason for a text messaging notification system! What if something DID happen but parents were assured on this old message? What if something didn't happen and people panicked because they don't trust administrators to post the most current information? We want our kids to be safe and know each moment if they are! I do know that the Albany school system yesterday was on code yellow and the teachers were there until after 5pm yesterday getting the students home. Perhaps by glorifying Cho and his viewpoints, the media has unwittingly made him a martyr and symbol for many disenfranchised, disincluded youth. 2) Every child is important! It only takes just one to greatly effect others. 3) We need SMS notification systems using cell phones to help create better safety nets for our children. 4) We need to throw our hearts at the problem and not just throw money at it. Students need people who care! We can create metal detectors but no heart detector has ever been created that will find evil plans in the human heart. A good teacher is the closest thing we will ever have to a heart detector besides a good parent. 5) We need to trust teachers. Teachers saw the danger coming at Virginia Tech. Trust the teachers and listen to them for indeed many of them have insight into their students rivaled by only their parents. Will a glass wall between the student and teacher make it safer? Will kids learn? I think of my friend at another school that I was talking to yesterday. There are thinking of installing glass walls to protect the teachers from the students. How can learning theories be adjusted for such an environment! Another teacher says that after she turned in her grades last period she was given them back and told, "You cannot give anything below a 70." We can't pass them to another grade level if they do not pass your class. So, you have to pass them. No choice. She was told to change her grades. My grades are sacred. Students earn grades and any time they are given, it teaches students that they have a right to be given other things they haven't earned. Another public school teacher piped up and said, "Well, they allow us not to pass students but then we have to write an action plan that takes at least 3 hours and so the teachers have said they are just going to give 70's." The idea of not passing kids to another grade level unless they pass is a noble one. The idea of giving 70's to keep too many kids from being held back is repugnant. Teaching is a noble profession and superintendants and principals who participate in such behavior, although it may be for valid budgetary reasons, are asking teachers to be untrue to everything they stand for! I don't profess to have the answers. I do profess to bring the controversial to my blog so that it will bring it to the attention to the many of you who read here who know more than I do about the answer. If you have insight, share it. Blog it. Comment it. If you have wisdom in this matter, I believe it is your responsibility to help all educators move through a tough time. This is also the time of year that we test. I am very sad today. Sad and thinking. Thinking about what our country needs to be and where we're going. Sad because every child deserves to be safe and every child, teacher, and administrator deserve to be treated with respect. Just sad. But I know this. The greatest men and women in the history of the world have risen to the top not during peace and prosperity but during the darkest hours of human existence. Do not give up and cocoon but make a difference where you are! At 76-years-old, the engineering professor blocked the door to his classroom on Monday morning to allow students to escape out the window. Some of the last ones to make the jump looked back to see Librescu killed by bullets from the gun of Cho Seung-Hui. A good teacher can save lives. A good teacher pours out their own life, maybe not in a moment as professor Librescu did but every day. Teachers stand between the world an anarchy. Teachers are the bridge from one civilized society to another. Teaching is a noble profession and out of every profession on this planet, I am proud that I am a teacher. I will love my students. I will comfort my students. I will hold the door every day of my life. On the Horizon we struggle with things we couldn't imagine: ENGLISH! Interestingly, in Horizon we have one thing that tends to be a "time waster." I was chatting with Terry Freedman about this last night. English! Little things kind of like the "You say potato I say potat-oh" song. Julie says analyse.... I say analyze. Julie says artefact...I say artifact. But none of us say "Let's call the whole thing off." It is frustrating because Firefox 2 is definitely set for American English. However, I'm to the point that if it is a correct English derivative that I will leave it on there. I don't think so. It is a matter of respect and understanding that there are different derivatives of English in the world. Julie says it much more eloquently than I, however, this is an issue that we have to discuss for global collaboration on all scales...and it wasn't evident until we started cooperate. There is a great conversation evolving over at Julie's blog, including a wikipedia entry on differing connotations in the English language. Truly, the conversations emerging from this project may end up being the greatest treasure trove outcome that we have. If you want to participate as a sounding board or as an expert reviewer it is not too late! I'm very excited to announce the George Siemens is going to be an expert reviewer and that Chrissy from Teach Saggitarian is going to host a class of middle school sounding board reviewers. hay, we did not have a class today and this is the first day of the weekend, with saisa starting, so i havent been able to come onto the wiki properly and as much as i can. but tomorrow i'll finish it all of. That's true. I think we've got the hardest topic to work on. So the resources can be found from the introduction page. i think this is something we're going to have to write predictions for. and address the issue of online safety. (the guy who did this, mr. darren Kuropatwa, was actually a judge for our flat classroom project. perhaps you could contact him and talk to him about it. I'm Ji Seong ('Seong' is just part of my first name lol) from Shanghai American School, ... I like to move to Art and Entertainment trend, since that was my first choice. If it is ok with you, can I work on that trend instead of Education trend? I believe Nelson is interested in that field. I like the conversations, we've had almost 200 discussions and over 200 edits in the first few days of the project. Beth Ritter-Guth's class stopped by and gave us some links over at Social Networking. If you want to be a sounding board, please contact us! It will take one day of class! We are still working on connecting the students. But when the connections begin happening, that is when the amazing learning starts taking place. I love these conversations! Note: We allow IM speak in the discussion areas, but not on the main wiki pages. Discussion areas are where they talk behind the main wiki page. To me, it is a little like telling the office that you're going to have a day out of the office at the beach to plan but making them show up in suits... what is the point? It is going to be expensive to get true high quality educational gaming. But, the fact is that true gaming can offer powerful rewards to even the most unlikely of people. Liverpool John Moores University found that Wii players who play 12 hours a week or so burn 1830 calories, or the equivalent of around 27 pounds a year. 12 hours a week of Wii is more than you think, but certainly 30-60 minutes a day is pretty conceivable. That's roughly equivalent to a 20 minute aerobic exercise, according to the article. Perhaps the answer to sedentary youths at PE who don't like to dress out is the wii? Would they be more willing to sweat if they are skateboarding or skiing or doing some outlandish thing in Wii? Wii is pulling in non gamers and is outpacing the competition as the gaming industry sits agape as retirement homes around the country have their residents wii-bowling! How can wii engage Bodily Kinesthetic Learners? Below is a letter I received from a parent (published here with permission) whose child found it cool again to play educational games online, such as math and reading, using the Wii Opera browser. Previously he would play those educational games on the browser from a laptop computer, but that got too boring. Now, however, with the cool Wii-mote, it’s a new ballgame. “On the Wii with the wireless [connection] all he has to do is point the [Wii-mote] controller to the right answer and click while watching his whole body move to get the right answer before the time runs out”, his father writes. We talk about how to engage our bodily kinesthetic learners and we have them get up and move and create. We do as much as we can to pull that into the classroom. Motion sensitive controls have so much potential and combined with the excitement of video games, wow! Motion sensitive controls might have a lot of potential with the quizzes and activities we already have! Wii have a lot to think about! What are the best blogs? The bloggers choice award is ready for your nomination. 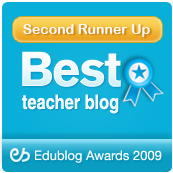 Nominations for best blog in education and many others. Will be fascinating to see which awards finally emerge as being the most meaningful. Horizon Rubric: Give your input! Probably 80 hours has been spent on this rubric with the goal being to get one rubric for all five classes. We are... close. (Lee Baber and her NETS certified associates are also taking a look at it as well.) Stop by and comment on the discussion tab of the rubric or leave a comment here as we make the final edits today. Something very incredible is beginning to happen in the edublogosphere... it is growing to include educators who don't blog. It is growing to include the offline network. It is growing and people are mobilizing to work together not just talk together. It is not just happening here but many of us are seeing it everywhere! We are part of something and a cause! Thank you for those of you who are contributing to this small piece. Off to school! The new news site... Wikipedia. "Not until I clicked on the Wikipedia article’s citations did I wind up at a major news outlet. I think Wikipedia-as-news-source is an important trend (and was the shining star in citizen journalism, according to one blog) ...I gave my students an opportunity today to see and comment on the Wikipedia-as-news-provider trend. After reviewing the article, the students talked about being impressed by the details. We also discussed the idea of smart mobs, which was new to most of them." Last time I checked the Wikipedia article, it had 138 sources. Although the talk page bounces around like a ping pong ball, actually many of the items "broke" there. This page has been edited over 500 times. On another note for bloggers, many in the blogosphere are calling for one day of blog silence on April 30th. An SMS system like the one Virginia Tech was planning to install last September, would have saved many lives. Use cell phones for safety. Realize it is a new day in education and it is time to use technology to make our campuses better and stop living in the papertiger past where such needless tragedies of nonconnectedness happen. A text message in the car would have saved lives! The day is coming when you will not be allowed to make them leave the cell phone at home. And I for one will factor in the presence of an SMS emergency notification system when my children go to college in 6 years. By the way, I found out about this from Andy Carvin at PBS.... on twitter. We are all grieving and praying for the families and university. Join us as we break ground with an online conversation with teachers in the field and teachers in a doctoral program with Dr. Cheri Toledo, from Illinois State University.This is how experienced teachers are embracing the new technologies. Sound checks between 8:30 and 8:45 EST pm Tues.Then at 8:50, I will start streaming, where you can listen at www.edtechtalk.com Channel A, and join the chat as well. You only need to put your name NO password to join t he chat. Since you are part of the show you may want to put your name Julie wow guest, so people will know you are part of the show! II.Since many of our listeners are considered "first wave" adopters of new technologies and new web tools, we are very interested in how we can continue bringing more people to this new way of doing business in education. a. Do you consider yourself a first wave adopter and why? Where do you get the support to continue trying new things? b. Do you consider yourself a second wave adopter and why? Where do you get the support to continue trying new things? c. If you did not have a course requirement to try blogging, wikis, podcasting, Skyping, what things wouldn't you be trying? d. What is your biggest challenge with all the new Web 2.0 tools? e. Now that you have tried many new Web 2.0 tools what things will you definately have in your classroom ? What is it that you can't live without? III. We applaud you and all the great work you are doing! Here is your opportunity to have your questions answered! There is a worldwide audience, so please ask away if you are trying to make connections with other classrooms or projects. To follow the terrible shootings at Virginia Tech today, keep an eye on Wikipedia. For current events, it is just more accurate. This is heartbreaking. Kudos to this video by Darren Draper. Kudos because this is the way that staff developers should be developing staff. I daresay this one video over e-mail will do more to motivate staff and get them talking than an hour of being "preached to" about Web 2! Using Web 2 to teach Web 2 - what a novel idea!? Staff developers -- are you encouraging your staff to make videos such as this? Is staff development stuck in Web 1 or is it modeling Web 2 as it teaches Web 2. Darren, you have made me think! Wow! Do you blog? I know we're all busy, but innovation is happening. Interestingly if you peruse the About Us for Horizon page, you'll see that many of the busiest people are each taking an hour or two for this project. This is about this project but it is also about having the conversations and research to improve education at a very real, practical level. Beth Ritter-Guth, an advisor to the virtual worlds team and Second Life Expert is organizing a conference and any of you who would like to present or discuss your viewpoints of this project need to get in touch with Beth immediately. Following is a transcript of our discussion today that I have used with her permission. Transcript from Google Talk on 4/14/07; sorry for the typos! Beth Ritter-Guth: 2007 SL BP Conference...HERE WE COME! Victoria: Now, I can go on the adult grid but they can't. Victoria: What is the date? Victoria: That is really cool! Victoria: Oh, our last day of school! Ha ha! Victoria: We get out at noon that day, but I could do it that afternoon. We could create the powerpoint or actually, how about a video that we stream in? Victoria: yes, we could do it that morning. Victoria: Or right after it gets out. How about I ask them if they want to see it or not. Victoria: Yes, we could prerecord a mov file! Victoria: That would be really amazing. Can I ask them if they want to watch on the smartboard or not? Victoria: They are doing movies and pulling in and presenting for their kids? Victoria: Hey, can I copy and paste this onto the Ning? Victoria: And if we do it in class, they could actually "be" me and we supervise. Victoria: I can share it on my blog too-- do you have a slurl or something? Victoria: Ok, I'm going to post this everywhere and will talk to my students about it (and administration). Victoria: The last day of school will be tough but I really feel like they are a small part of a very big and growing revolution. I want them to be a part and what a way to end. How long would it be? Victoria: OK, and do you want me to mention it to the other teachers on the project. Victoria: You might even want Sharon Peters who is working with the sounding board in there too. We would probably only be able to do 20-30 minutes at most. Victoria: We run a short schedule on the last da. OK, I'll get back to you on Monday. Victoria: The kids are the center of this thing and that would be really cool. We could see if some of the people from the NMC would come in. Victoria: Alan Levine is an advisor on the horizon project and has been VERY helpful with some questions. Victoria: YES! Awesome! I'll ahve to come over and edit. And some way to film it. I don't know how to do machinima. Victoria: Oh, that would be great. Because I would love for that group to have some real machinima in their final video. I've already required them to listen to last week's show. Beth: what is the link? Victoria: to their project page? I'm going to make sure that everyone over at horizon and on my blog looks at this. Victoria: And I'll let you know on Monday -- If we do it, it will be from 8 a.m. until around 8:40 on Monday at the longest -- maybe closer to 8:10-8:30 but I have to check the final schedule. I wish there was a way to have it on an island on the teen grid and get approval for the adults who enter. Victoria: And yo uare the originator? Victoria: OK, I'm going to leave up this box and copy some of it onto the blog in amoment. graham wegner is thinking about agreeing to be a sounding board for our peer review process. And give advice for middle school peer review. Victoria: It is very exciting. OK, thank you and I'm going to be in touch on Monday. Victoria: Oh YEAH! Now that would be awesome! Victoria: Well, it sounds like you have some work to do. We'll just make ourselves available. And I hope to do an interview with you for our team next week. I'll be in touch. Victoria: OK, we'll be in touch. I'm excited and I'll pass this along! So, if you want to present or be involved, get in touch with Beth. One rule on the new Internet -- don't wait to be asked, if you see something that interests you, don't say "I'm not important, they wouldn't want me" because I guess I was blessed early on by not knowing how important the people are that helped me and were encouraging me with their comments and e-mails. I guess I didn't know I might need to think about being intimidated. All the people here are just like you and I -- they want to make a difference and they live their lives like the rest of us -- still feeling like that 16 year old kid wondering what they'd do when they grew up and wondering how the rest of their life will pan out. I don't know about the future, but I'm proud to be small part of an educational revolution that is growing up around the feet of education. Will you join in and add your voice and practices? We need 3 experts to give three specific teams expert feedback during the project via the wiki on April 23rd, do you know an expert or person who follows these areas? From the Horizon Project Ning (our behind the scenes place to share) I am sharing SOME of my posts here as well. OK, call me a geek. "OK, I"m a geek." As a part programmer/entreprenuer from the 90's and a graduate of Georgia Tech, programming is something I do. Ran up against this really cool tool called Grazr that lets you do cool things with your feeds like I did on the Horizon news page. OK, so how did I do it? 1) I pulled all of the feeds I wanted into my bloglines account and put it in the first folder called "horizon." 2) Then, I exported the subscriptions to an OPML feed and saved it onto my hard drive. 3) Then, I opened it in Notepad and deleted out all of the feeds I didn't want (careful to preserve the two ending tags there) and changed the title to Horizon project Feeds... (the thing you see in the title.) and resaved it. 4) I opened an account at grazr, uploaded the file and put in the information. I also created a "widget" which gives me the code to paste it on the blog or the wiki. I put a grazr button on the wiki, and used the little TV button on the toolbar to insert the full grazr like I have done on the news page for the students. If you need help or I haven't made it super clear, let me know and I'll clarify in this blog post! Sure, with how we teach now kids can pass the "test" but can they make it in the real world that is devoid of standardized tests to prove mastery? If one of your students is standing over you as the doctor in the ER trying to decide which procedure to do on you to save your life, will she have to have a highlighter, peppermints, a bottle of water, and a TAKS game plan to save you? He goes on to talk about what students need in today's world. "State learning standards may help high school teachers focus their coursework, but college faculty say they're focusing on the wrong things, says a report that finds a "significant gap" between what high school instructors teach and what college faculty think entering freshmen ought to know"
What do kids need to know? Less concepts and more thinking skills! This is based on a report from the ACT National Curriculum survey (a must read for curriculum directors). At the local coffee shop today, all I could hear was several parents who have kids in public school complaining about how their children have been doing CRCT review for SIX WEEKS in EVERY CLASS! Many of them are fed up but don't know where to go and have no alternative. And yet, it strikes me, although we do a little test review here at Westwood (more how to take the test than anything), it is rare that any of our classes fall much below the 85th percentile in any subject with most in the 90th percentile in the nation. And honestly, looking at our IQ tests, we really have the full range of intelligence levels. and people who are willing to put a lot of blood sweat and tears into the education of their children. Do we test? Yes, every test is cumulative. However, we no longer have end of semester exams but rather, projects and large genuine assessments in all subjects except math. We're not perfect, but it is a whole lot better than making kids bubble letters for the last six weeks. That is demeaning to the children and the teachers. And when it is time to bubble letters, our kid's shine! If we were creating kids who would have to fill in ovals, we're doing pretty well at coloring circles, I think. When I was a businesswoman in the business world, I didn't always want someone who always agreed with me and spit back what I told them. Problem solvers and original thinkers who pushed the envelope. Forward thinking, organized, motivated, excited, people with a great work ethic and a good, solid education but who realized when they didn't know something and knew how to find out how! OK, some of my pundits will accuse me of getting "preachy" but I have spent enough time (10 years) working with public education teachers to know that many of them are getting fed up with the "system" of trying to produce test scores instead of well educated students. We've got to make the main thing the main thing, let the teachers teach, and help the students think. The educators working on Horizon have a private Ning that we're not sharing. However, as I post my reflections there, I am going to bring some of them that are appropriate here to my public blog. A student literally RAN to me this morning. "Mrs. Vicki, Mrs. Vicki, I was up all night and my Internet was down, you have GOT to answer my question! This word came from the Horizon report which he was reading again as he was going to sleep last night. The report talked about a symposium conducted online. Symposium of course is an "SAT word" and I think an important one to move to higher education. But it is not just about that! We teach students here to read with pen and highlighter handy (even our literature books) and he had circled this word in several places. Now, Horizon is not about vocabulary and yet it hit me, it is! But I'll say this, it is definitely college-level reading material. Perhaps by exposing students to such scholarly reports and talking with them as they digest it, we are indeed building vocabulary and reading skills as well as being a great project. THat way students have their dictionary with them all night and don't have to be distressed trying to figure out the meaning of symposium! So basically, although centered around technology, this is a great project for reading comprehension and vocabulary as well. Sorry for the long post but I want to give you all of the details about this project and give you a special invitation to join us. I've tried to contact as many as I can but I haven't gotten to my whole list! Please e-mail me or leave a comment here! and just what we've just begun! as we forge ahead like a herd of turtles. if we'll work to jump the hurdles. and in the hearts of men. and put your heart on the horizon again. This includes 60 students in five countries but represents many more nationalities and cultures. We are analyzing the trends that will significantly impact college education (and our society) in the next 1-5 years. We are looking at them now, predicting the future, and making proposals about what the students think that needs to happen. Like the flat classroom project, we are researching the trends AND experiencing the trends in this form of wiki-centric, web 2 enabled scholarship. What are our goals and who is involved? We've created a very complete About Us page naming the people who thus far have agreed or volunteered to help and explaining the "why's" as best we can. But our focus is the students! Amazingly twenty six of you have agreed to help in several areas. We appreciate it, but know that if you are interested in such a project for your school we have room for more. Here is my introductory message (we all post podcasts or avatar-enabled video to start). Do you or your classroom have one Class period? A major weakness of the flat classroom project according to our advisory panel (and the students) was the lack of peer review and feedback during the project (which consisted of only the teacher's feedback.) The students felt like that the judge feedback was so good that they should have had it sooner. Sharon Peters, who has collaborated on no less than six international collaborative projects (and provided peer feedback on many more) has agreed to be our "Head Coach" for the Sounding Board process. She will share her lesson plan (one class period) and assessment strategies for teaching your classroom effective peer review strategies. If you join in, you as the teacher will be added to the wiki, and our private ning discussion area for educators only (not students) so that you can work with Sharon to give your feedback and refine the process of peer review. The students and judges hungered for feedback earlier in the process. a) We've created a tagging standard and are going to be coaching them about how to use delicious to share resources. YOU CAN TAG TOO and send them feedback on the trends analyzed in this project. It will feed to their wiki via RSS. b) We have a group of "experts" that will give feedback to the teams via the discussion tab on the wiki only on April 23rd. They will read over the wiki and point out research and things the students need to be looking at. (This is in addition to feedback from the teachers that is provided on a weekly basis as well.) If you are interested, please get in touch with me at coolcatteacher at gmail.com! We kept the judging process but have renamed it Expert Review Panel. They will use the judging rubric to evaluate 4-5 wiki pages each and provide feedback after the project is over and awards modeled after the last project. This is who is on board thus far. We are also working to include several researchers and have forms to allow researchers to observe that we are going to ask the classrooms to sign. Most if not all will be over skype and no student will be interviewed without a teacher present. All contact will be made through the teacher and through observations on the wiki. We wanted to make sure that we did a better job this time of capturing the process. When people wait and observe the final product, for the most part, they look so good that it is intimidating. The messy, tough, challenging process was never observed and far too many teachers say: "I can't do it." It is such an all consuming process that we too forget the nuances. We would love some from other countries! Our plan is to conclude with a youth summit and right now we are seeking a platform such as elluminate or WebX that could allow the students to log in at various times and present their video and share what they learned. We would like to allow you and students access to the presentations and literally have educators around the world talking about the future and led by the future. Each team has a student project manager. These are, for the most part, students who mastered flat classroom I. They will be coordinating their teams and facilitating collaboration and intra-wiki linking between all projects to promote group synergies. The hard work, like last time, is before the project started. Julie and I have been working for over a month as have the advisers and the teachers who are coming on board. This takes a lot of work. The great thing is that we are working to leave "tracks" that others can follow. If the rubric works, guess what, you don't have to spend 20 hours on it like we did -- you can use that one. If the templates work, and you do a project, after we revise the templates, you can copy and paste it and don't have to spend the 10-15 hours we've spent working on them and developing them. But we need good feedback, many educators are cutting and pasting these rubrics and templates so they need to be right! I guess it is like when my dad used to clear a field when I was a child. It could take a month to cut down the trees and pull up stumps and rocks, but after that, all he had to do was till the land under. It became easier. Now three amazing new teachers are coming into the project and it makes Julie and I make sure that we document things. As I said, I am a farm girl. And when I grew up I remember going down to the gas station and listening to a lot of the farmers sit around and talk about when they were going to plant and what they were going to plant and how their harvest was going to be better. Dad didn't hang around there... he was out planting! Well, we can talk about School 2.0 and Web 2.0, and global collaboration, and all of the principles in the Horizon Report all day long but there are some people (not just us) who are out there planting! We've got to do our part to plant so that we will begin to move students not only towards information literacy but digital literacy and collaborative literacy as well as effective techno-personal skills. We're not the only ones but we are part of the process of change and we welcome all others who want to join in! We are trying to be inclusive connectors! Here's your invitation! We can't e-mail everyone! A widening chasm is occurring between what businesses need and demand and what educational institutions are producing today. Educational institutions value paper.. Businesses are cutting it out. Educational institutions value face to face interaction. Businesses are promoting virtual interactions. Educational institutions value peer review journals many of which take 2 years to publish. Businesses value peer reviewed blogs and wikis to promote rapid information exchange. Educational institutions look down on many internet sources...things take time. Businesses want information at the end of their fingertips... time is money. Educational institutions want to take away gadgets and keep students from using them. Businesses want to give their employees more gadgets and expect them to figure it out. Educational institutions often want students to learn before they create. Businesses want students to learn as they create! There are many educational activists out there who want to see all of us, ourselves included, produce better, more competent, stronger students. We want to see all students succeed and to help students understand that morality doesn't stop at the computer screen. Our heart is on the horizon. If your heart is on the horizon... will you join us? Thank you Julie for your hard work and dedication! Thank you Barbara and John and Ed for believing that such projects can be done! I think I'll have changes to this tomorrow, I am so tired. But here it is for you! What are the websites your students love most? Sony requires its marketing staff to blog? Is this the future of education: the micro PC.